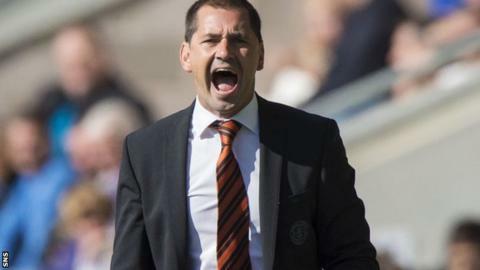 Dundee United manager Jackie McNamara was delighted with his side's 3-0 win away to St Mirren but admitted that his team can play better. Chris Erskine, Jaroslaw Fojut and Blair Spittal all netted for the visitors in Paisley, but McNamara expects more. "I don't think the performance was as good as we can play, I think the score line flattered us a bit," said McNamara. "We were not at our best in terms of fluency and possession today." McNamara was also keen to praise the contributions of goal scorers Erskine and Spittal as well as Callum Morris, three players who he believes are now showing they have what it takes to make it at this level after stepping up from a lower standard. "Chris Erskine is a different player to what we have here, he's a little bit unorthodox but showed with his great first touch at the goal that he can be a good player for us," said McNamara. "Maybe it took him six months playing at this level to adapt to playing in this division when he was with Partick Thistle. "I was delighted Blair got on the score sheet too and I thought young Callum Morris performed so well for us today too. "When I was at Partick Thistle I watched him for a couple of years at Dunfermline and he has been outstanding for us this season."